It sounds like a cliche but it is true nevertheless. Surviving cancer changes a person. More than most, cancer survivors possess a keen sense of their own mortality. They know intimately the fragile and transient nature of life. Maybe it ends tomorrow, maybe a decade from now. But it will end. So the desire not just to live, but to do something meaningful, can come sharply into focus. "Everyone always does it. I did it. There are things you want to do, but you always think there is time. You put it off to some time in the future when you think circumstances will be perfect. But then you never do it," says Joan Hatcher. "After my experience with cancer, I couldn't wait anymore. There wasn't time to wait anymore." 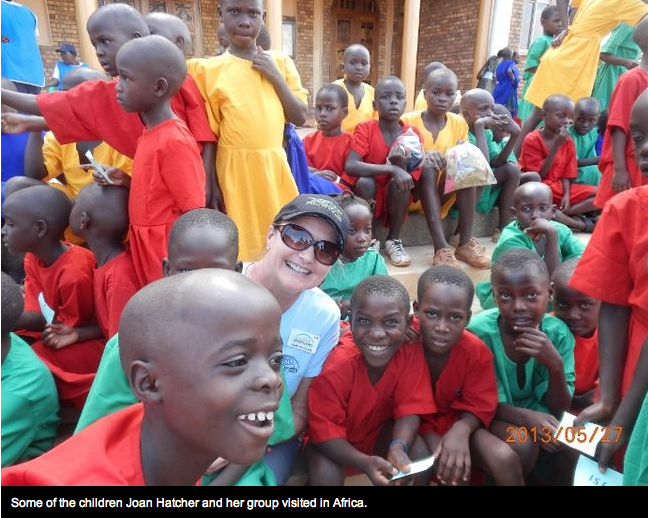 Knowing time was no longer her ally, Hatcher boarded a plane to Africa to help children in need. Five years ago, Hatcher's life stepped through the Looking Glass when a routine mammogram discovered she had breast cancer. At the time, she believed herself to be indestructible. Even though the disease killed her sister, Hatcher refused to accept cancer could touch her. A double mastectomy followed. Chemotherapy. Hair loss. Breast reconstruction surgery. It redefined Hatcher's entire life. Knowing how quickly sand could run out of the hour glass, the Niagara Health System physician recruiter started doing things she always wanted to do. Including going to Africa. "While I was going through all my chemo and surgery in 2010, I had some very good friends who went on a bed distribution trip with the Sleeping Children Around The World organization," Hatcher said. "I had always said I was going to go to Africa someday. I heard them talk about and saw their pictures and when I went home I realized that someday is now." Hatcher says she had long known about Sleeping Children, a charitable organization that provides bedding, clothes and school supplies to children in need in Third World countries. A family friend had once donated a bed kit to the group in Hatcher's late father's name. She's made donations to the group, but now she wanted to be part of the front line, distributing the kits in some of the poorest areas of the planet. Hatcher was interviewed and accepted as a volunteer quickly, but it took two years of waiting before she was able to go on a trip. "They have a number of volunteers and they can only take one first timer on a trip," Hatcher said. She left on May 22. She returned three weeks later with a new perspective on the world. The conditions many of the children in Ugandan villages are living in were shocking to Hatcher. No utilities. Sometimes, not even a floor. She even saw once shack a family called home that featured a massive anthill in the living room. Although she stayed in conditions better than the children, Hatcher — who admits to being attached to her creature comforts — had to go without most of the amenities of home. "You'd shower, but it was so hot that the moment you got out you were sweating again," she said. "Uganda is covered in this fine, red dirt and by the end of the day it was everywhere. You were covered in it." It didn't matter. The Sleeping Children group she was with handed out 500 kits a day. They would travel to drop-off locations and people from nearby villages would walk to meet them. Hatcher said the bed kits were a vast improvement over what the kids already had, but they were not about providing luxury, but saving lives. Mosquito borne malaria is a killer in Uganda. "So it was a matter of life and death in some cases," she said. "We saw so many children with malaria." Although the netting might be the most critical part of the kits, the school supplies were what put smiles on the children's faces. "They went crazy for that. Absolutely nuts," Hatcher says. "They don't have anything like paper. This meant they could go to school." Hatcher says education has allowed some Ugandans to start to break the the cycle of poverty, and the younger generation knows it. "It's one thing to go and do something you've always wanted to do, but it is another to something that really has an impact, that makes a difference in the lives other people," Hatcher says. "I would go again in a heartbeat." It was only three weeks. But much like the disease that drove her to go, those weeks in Africa changed the way Hatcher viewed her place in the world. Sleeping children is a not-for-profit that delivers bed kits to children living in poverty around the world. A donation of $35 provides a kit of a mattress, sheets, clothes, a mosquito net, pillow and school supplies to kids. The 43-year-old organization has provided kits to children in 33 countries.